What comes to your mind when you pick up a graphic novel? Is it the pictures? The plot? What if instead, the thought was the destination? Graphic novels can take you anywhere, and with the pictures, you can be there in the moment. So pick up one of these six graphic novels from our July/August 2018 issue and ask yourself: Where are you going? 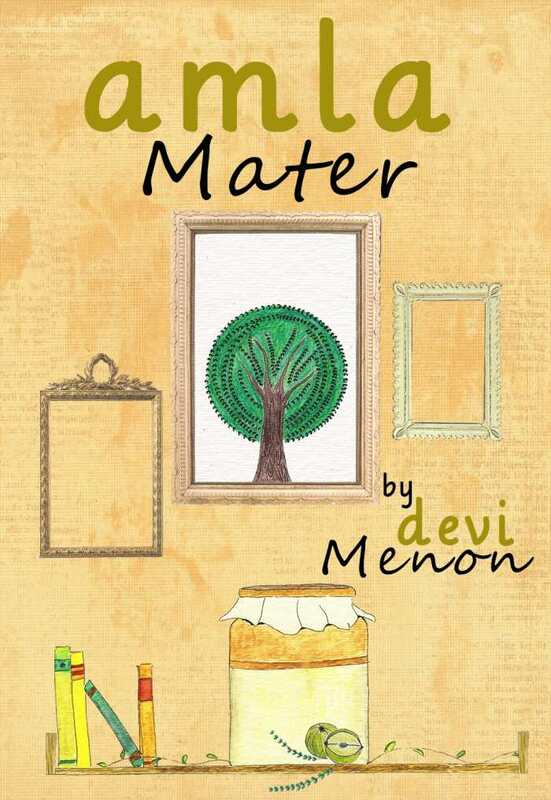 In Amla Mater, Devi Menon presents the sweet and nostalgic story of Mili, a woman who recalls her past in India from her new home in the United Kingdom. For Mili, it’s an amla, or Indian gooseberry, that triggers her series of recollections of growing up in India, much like Marcel Proust’s madeleine in Remembrance of Things Past. She recalls her childhood friend Maya, her first job, former flatmates, and her parents’ accident. Amla Mater is a meditation on memory, often touching in simple ways, but never maudlin or manipulative. Menon’s art is simple but graceful, and carries an air of intimacy as it translates her character’s memories to the page. The book’s title can be seen as a play on “alma mater,” the Latin term for a center of learning that nourishes an individual’s development, as Mili’s time in India was for her. Recommended for anyone, but perhaps especially for those whose childhoods are far away in memory and in distance. 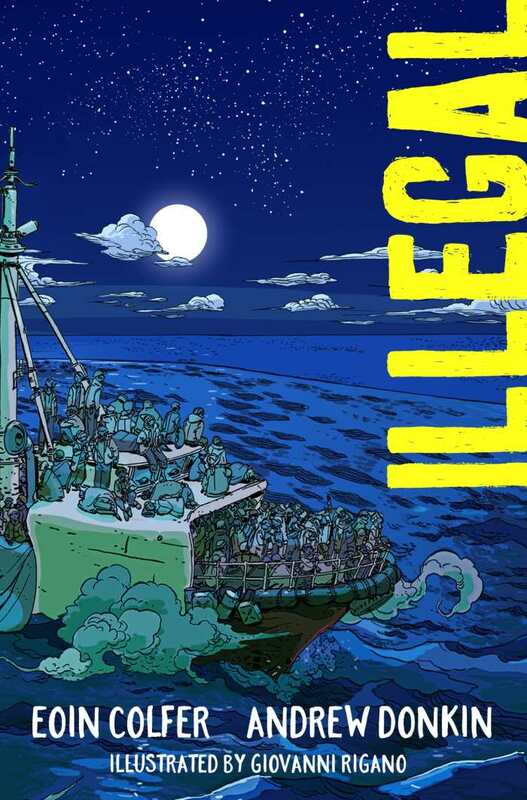 Bill Morrison adapts the Beatles’ famous animated musical film for his graphic novel The Beatles Yellow Submarine. Yellow Submarine, which debuted fifty years ago in 1968, was groundbreaking for its inventive psychedelic animation and colors; it was also an entertaining way for the Beatles to transfer their music into another medium. 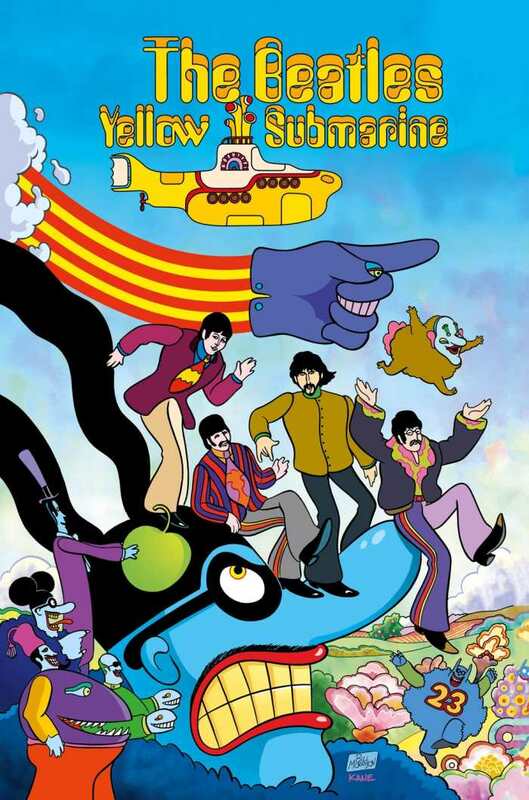 But Yellow Submarine had so much going for it visually that it was possible to forget the music and just enjoy the film as a fun, somewhat bizarre cartoon adventure. That’s exactly the approach Morrison takes in this adaptation. Possibly due to issues with publishing rights, the film’s songs aren’t included in the book, so fans who remember a particular bit of dialogue leading in to “Sgt. Pepper’s Lonely Hearts Club Band” or “When I’m Sixty-Four” might be surprised at the absence of those lyrics. But otherwise, Morrison remains faithful to the movie, with the Blue Meanies who invade Pepperland trying to destroy the music, beauty, and joy therein, and the Fab Four answering a call for help. Morrison’s art is often stunning—as he explains in the book’s foreword, he set out to make “each page look like a poster.” The graphic novel’s visuals don’t morph and move, of course, but they’re still quite impressive to gaze upon. Additionally, the graphic novel format allows one to linger on the clever script, especially the amusing utterings of Jeremy, the “Nowhere Man,” along with many successful one-liners by the Beatles themselves. The Beatles Yellow Submarine is fun for readers of any age; for Beatles fans, it’s a no-brainer. 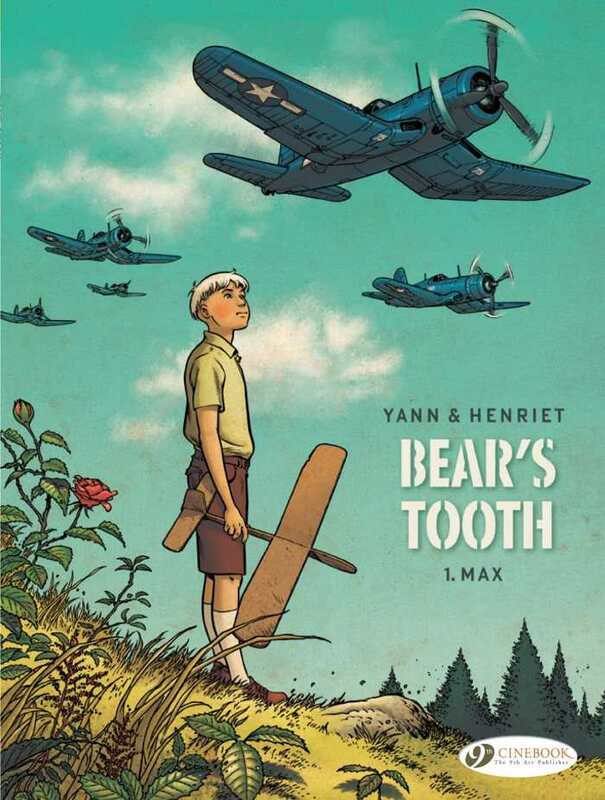 Bear’s Tooth 1: Max, a graphic novel by Yann and Alain Henriet, is the first of three books so far that tell the story of three childhood friends whose fates will be linked as adults throughout World War II. Translated from the original French, Bear’s Tooth begins with an exciting World War II battle scene: an American convoy fighting off a kamikaze attack at sea. One pilot’s actions stand out, and via flashback, he is introduced as a child, along with his two friends. Max, Hanna, and Werner grow up in Silesia, a Polish area whose control is disputed by Germany. The kids all dream of piloting planes, but complicating matters is the fact that Max is Jewish, while Werner and Hanna are of German descent. Werner dismisses Max’s concerns about the creeping Nazi influence: “Nazism? Pah! It’s just like scouting!” But Max’s family, fleeing persecution, emigrates to America, putting Max on the course to becoming a pilot for the United States. Before he leaves, the three children vow to be friends forever, but the book’s ending sets up a dramatic confrontation that will test that promise. Yann’s story soars, placing three innocent children in the path of historical events that alter their lives uncontrollably. Though there’s a grand drama playing out, it’s the small instances of characterization—Werner’s ignorance of the Nazi ideology, and his later efforts to protect Max, for example—that bring the book to life. Henriet’s art is outstanding, crisp, and clean. He excels at detailed battle scenes and the subtle expressions and gestures of conversations. Bear’s Tooth 1: Max is a compelling book whose ending will have readers breathlessly anticipating the next volume. 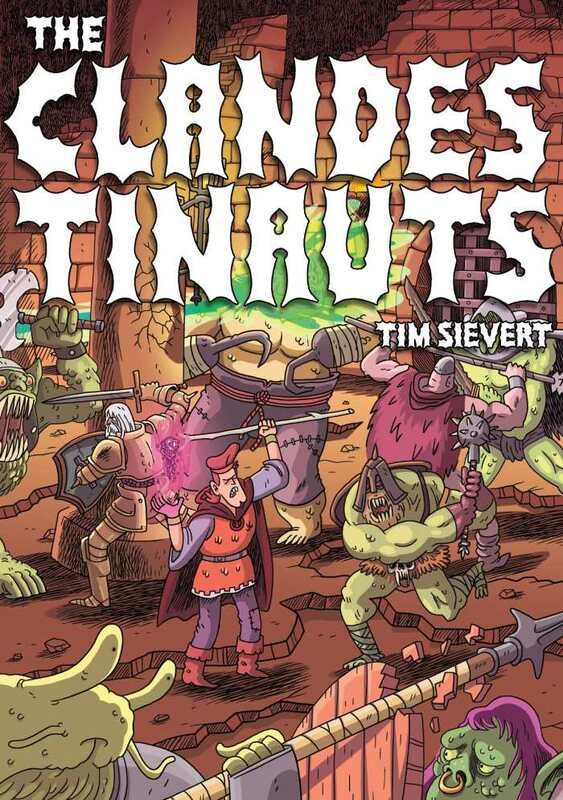 Raw, visceral, and direct from the creator’s id comes The Clandestinauts by Tim Sievert, a graphic novel about a group of Dungeons & Dragons–style adventurers. The juxtaposition of those elements is refreshing and surprising—such fantasy books tend to be weighed down by “high,” formal language, but here, that kind of overblown verbiage is played mostly for laughs, while the characters occasionally lead with shorter, baser comments, such as “What are you looking at, granny?” and “Oh wow, sorry.” Also entertaining are the interparty dynamics, often driven by greed, jealousy, and distrust. The plot is sprawling and unpredictable, involving a quest for a goblet, a trip to hell, and a multitude of monsters and evil wizards. Sievert’s style is exciting, though the storytelling is occasionally difficult to follow—probably as a byproduct of the frenzied pace that’s implied. The story feels like a fever dream that Sievert rushed to get down on paper before he forgot it. The book doesn’t use full color but rather marks different scenes or settings by using varying monochrome shading—one scene is cast in orange, another in green, another in red, etc. The story offers a satisfying end, with the hint of a possible return of the Clandestinauts in future tales. Humorous and irreverent but an adventure nonetheless, The Clandestinauts is perfect for those who don’t always need to take their role playing seriously. In Go West, a man seeks vengeance on the killer of his wife and child in a lawless western territory. Gunn begins his tale with some background: outlaws have pushed the government out of America’s western territories, and now rule with an iron fist. Through the recollections of the book’s main character, Slade the Blade, it becomes clear that he worked for the outlaw leader, Creep, and that Slade’s family was killed when he tried to quit. Slade collects a few key allies—a woman who leads the town of “Lost Vegas” and her friend, a gang chief. Together with their soldiers, the three confront Creep and his forces. Despite the fact that the story is set more than one hundred years in the future, the weapons and vehicles used are twentieth-century technology; this is a somewhat charming touch, though one without a real explanation. And though Slade looks like a roughed-up cowboy, another character sports a mohawk and skull bandana—a nod to the story’s Mad-Max-meets-classic-western feel. The book is entertainingly gory and a bit absurd, as when a tomahawk chop slices a man’s head in two horizontally. 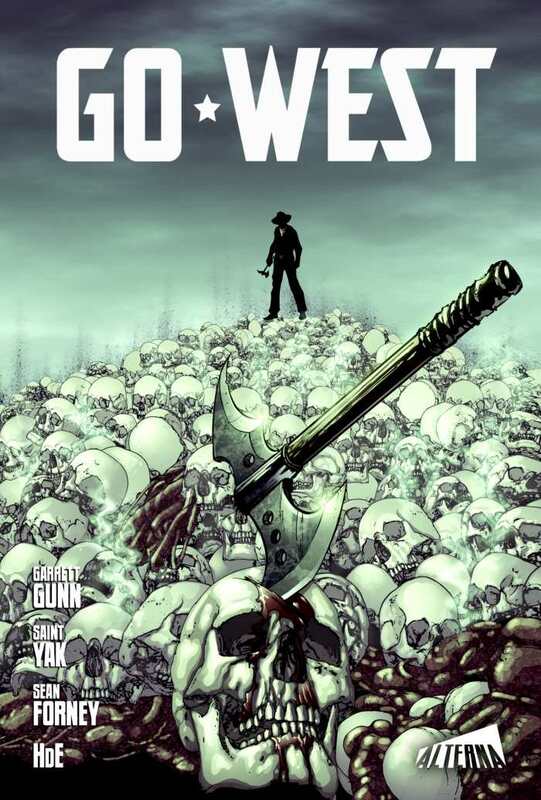 At its best, Go West pulls up just short of self-parody, and Saint Yak’s art delivers the violence with flair.